Part of Zagar's Magic Garden. 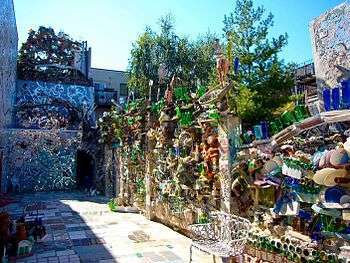 Philadelphia's Magic Gardens is a non-profit organization, folk art environment, and gallery space on South Street in Philadelphia, Pennsylvania. To date, it is the largest work created by mosaic artist Isaiah Zagar. 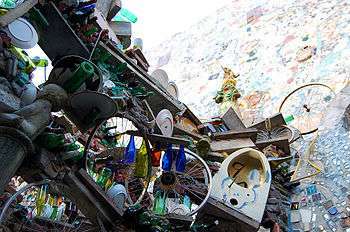 The Magic Gardens spans three city lots, and includes indoor galleries and a large outdoor labyrinth. The mosaics are made up of everything from kitchen tiles to bike wheels, Latin-American art to china plates. The space is open for public view, from 11:00-6:00 Wednesday through Monday and closed on Tuesdays. Isaiah and his wife Julia moved to South Street in 1968, when the area was being slated for demolition by the city in order to create the Crosstown Expressway (I-695), which would have linked I-76 and I-95. Due to this proposed construction, the area was desolate and dangerous. The Zagars were one of the first people to come to this area and begin to turn its image around. They opened the Eyes Gallery on 402 South Street, which was the first property that Isaiah would mosaic. Here they still showcase and sell the art of Latin-American artists. After the Eyes Gallery, the Zagars went on to purchase and rent out several other buildings, and Isaiah would go on to create several other mosaicked spaces and public murals. He bought the building that currently houses Philadelphia's Magic Gardens in 1994. He fenced off the two vacant lots next door in order to keep out garbage and vermin, and over the next fourteen years began creating the Magic Gardens. In 2002 the landowner of the two vacant lots wanted to sell the land due to rising property values on South Street. Together with members of the community, Isaiah was able to purchase the lots. With this purchase "Philadelphia's Magic Gardens" was born, and is currently dedicated to inspiring creativity and community engagement. ↑ Schlegel, Jeff (2009-05-07). 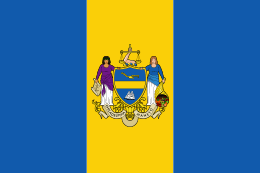 "36 Hours in Philadelphia". The New York Times. Retrieved 2011-05-27.